The Practically Green Festival was a fantastic day. 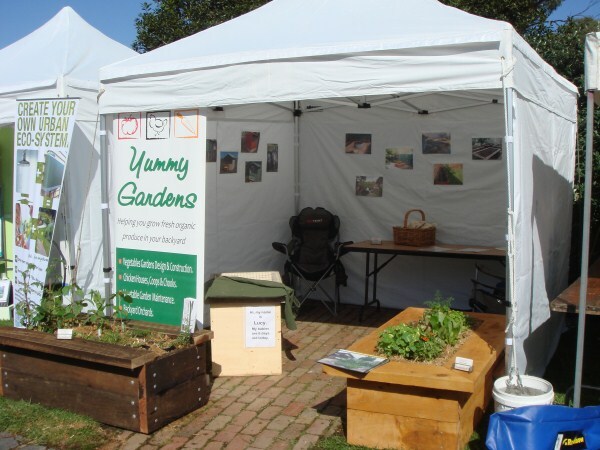 The weather was fine and we met alot of people really interested in sustainable living and growing their own food. The benefits of growing and eating your own produce as possible are absolutely endless. You can be sure there are no nasties in what you are eating when its home grown and of course no other fruit or vegies taste as special and other eggs are never as yellow and tasty. 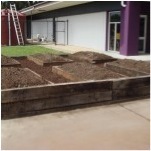 We were recently contacted by a primary school to help them with their existing vegie bed. They had one big bed which was very wide which meant you had to climb in it to get to the vegies in the middle. 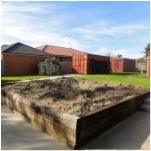 We utilised their existing bed and divided it up into 6 beds that the kids can easily reach into. We also filled the new beds with some great organic vegie mix and put bark around the beds which is nice and soft on little knees. At the moment we are busy getting ready for the Practically Green Festival at Edendale Farm in Eltham on Sunday 23rd October. The festival celebrates sustainable living and it should be a great day with lots of things to do and see.